Compare our top Platinum Cards below. Think of these cards as step one on the premium rewards ladder. They’ll give you more opportunities to earn rewards or frequent flyer points than your standard piece of plastic, but for a higher annual fee. As for features, some gold cards listed on our database offer free travel insurance for you and the whole family, purchase security insurance and the option for you to add extra cardholders. One limitation you may come across with a gold card is a cap on the number of points you can earn. These are the most common type of premium cards in the market, with most banks and credit providers having a platinum card offering. There isn’t a standard platinum card but common features of these cards will include a rewards program (either with airline frequent flyer club membership, or rewards like cashback, shopping or travel rewards), free insurance and concierge. Keep your eyes peeled for bonus point offers available to new cardholders too as these can help you to redeem rewards fast! As expected, annual fees on platinum card fees can climb high in return for these benefits. At the high end are black credit cards which usually involve most, if not all of the premium card features we’ve mentioned above and more. These cards have annual fees in the hundreds, but for this you’ll get a range of perks from priority passes at airport lounges to concierge services on demand. Partner networks are larger too, giving you more room to shop for bonus points. Most black credit cards in the market will have a minimum income requirement of $75k and over. 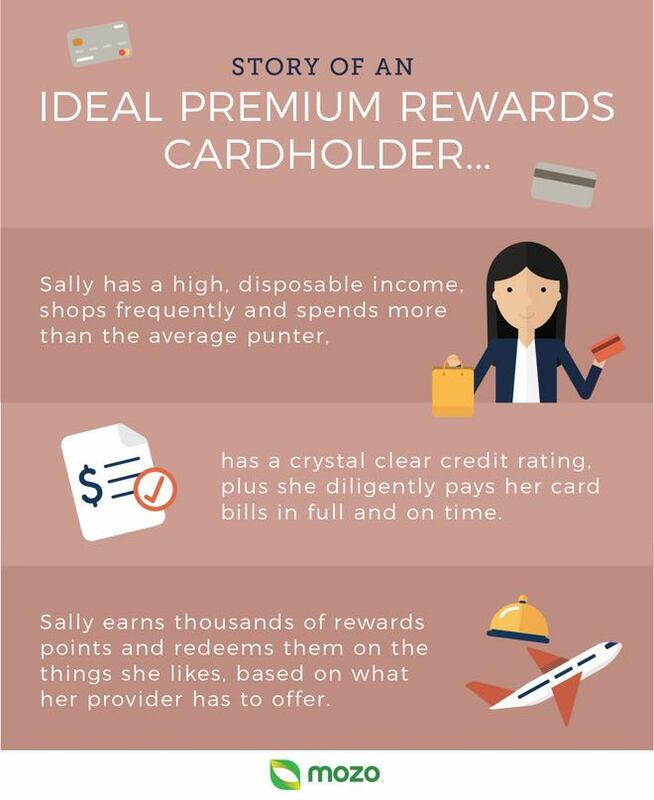 What are the benefits of a premium rewards card? Generous rewards earning rates: Premium rewards credit cards are almost guaranteed to give you more bang for your buck when it comes to the earn rate for each dollar you spend! For instance, one card in our database will give you up to 3 points for every dollar you spend, while other rewards cards at the lower end of the scale may only offer 0.5 of a point on the same frequent flyer program. Bonus points when you sign up: A quick glance at our rewards card hub demonstrates that there are plenty of bonus point signup deals to choose from with premium perks. But compare redemption rates as not all cards are equal and check if you need to spend a certain amount within a specified time-frame to unlock the points. Attractive frequent flyer programs to connect with: Whether you have a Qantas Frequent Flyer membership, or one with Virgin’s Velocity Frequent Flyer program, chances are you can link your premium card to it, and most other airline programs out there too. Rewards choices: You’re spoilt for choice when it comes to premium rewards cards, as most allow you to redeem points on flights, online shopping, cashback offers and the list goes on! Complimentary insurances: It depends on the product you’re looking at, but many premium cards throw insurance freebies into the mix, from comprehensive travel protection to rental car insurance. Higher credit limits: Another thing you’ll find with premium cards is that credit limits are higher than regular plastic, and there are minimum credit limit requirements too. For instance, credit limits on premium cards start at around $4k and can go up to $100K or more. Did you know that one card on our site has a yearly fee of $749? But the key with paying any annual fee is to ensure that you’re getting value for the amount. So long as you receive optimal rewards or benefits like free travel insurance in return, the cost won’t matter too much. Keep in mind, these fees are required to be paid upfront and every anniversary after that. Depending on the card, your provider may place a limit on the number of points you can earn or have accrued in your points balance at any one time. The good news is, some premium cards in the market allow you to earn as many as you like! Just watch out for the frequent flyer or membership points with expiry dates, so you don’t miss out on rewards redemption. So long as you pay your balance in full and on time each month, you’ll be shielded from credit card interest rates. But make no mistake - premium card purchase rates can climb to the early twenties! Ready to join the premium card crew and start enjoying those rewards? We’ll leave you with some final things to remember. 1. Purchase rate: According to the Mozo database at the time of writing, the highest rewards card purchase rate is a steep 22.74% so be sure that you pay your balance off in full each month to avoid high interest charges! 2. Interest free days: The number of days you have before interest kicks in with premium credit cards will usually range from 44 to 55 days. 3. Cash advance rate: If you withdraw money from an ATM in Australia or overseas with your credit card you’ll pay a cash advance rate, which at the time of writing will be between 13.20% to 29.49%. Also be aware that with cash advances you don’t get any interest free days, and will also be charged a fee which is usually a percentage of the cash amount. 4. Foreign exchange fee: Regular jet setter? If you plan on using your premium rewards card in other currencies abroad, you’ll pay a foreign exchange margin on top of the purchase rate, which is an average 2.91%. Some cards are specifically designed with travellers in mind, and charge lower fees so look for one that has low or no foreign exchange fees. 5. Minimum income requirement: Premium cards are designed for those with a certain income and annual credit card spend. Keep this in mind when you’re looking for a premium card, as some providers require that you be on a $100k salary, while others will approve applicants on $30k. Now you’re no longer new to the world of premium rewards cards, visit our rewards hub to compare top deals. Alternatively, let Mozo’s rewards revealer tool do the matchmaking for you based on your estimated annual spend, in just one minute.